In 2016, InstaForex again proved its leadership among brokerage companies and received several prestigious awards from well-known business periodicals. For many years, InstaForex maintains the reputation of the best Forex broker in Asia, but the company is gaining in popularity in other regions. 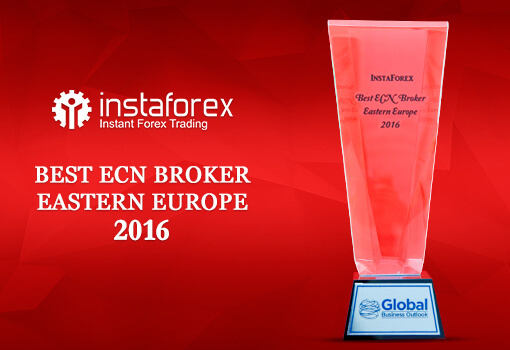 So, InstaForex was presented with the award as the Best ECN Broker Eastern Europe 2016 by Global Business Outlook, the UK business magazine. Companies from any country in the world operating in any sector can be honored by Global Business Outlook for outstanding performance both at a regional and international level. A grand award ceremony is the cherry on the cake. In 2016, over 100 companies from around the world were nominated for awards in the banking sector, real estate sector as well as for regional and global awards. InstaForex earned a regional award and was recognized as the best brokerage firm providing trading services in Eastern Europe. This is the first trophy from Global Business Outlook in our vast collection. We greatly appreciate professional recognition of InstaForex in Eastern Europe as it means that InstaForex trading services are increasingly popular among Eastern European clients. We are proud of their trust.